Trading since 1999, Kingfisher Project Developments Ltd is an all round building company. Director Richard Davies has worked in the construction industry throughout his career, training initially as a bricklayer. He will not only personally manage your project but will also be hands-on in the construction process. In addition, as this is a family run enterprise, Amanda will be available in the company office to be a second point of contact during your works. Kingfisher Project Developments Ltd is an NHBC Registered Builder and an Accredited Contractor for the Contractors Health & Safety Assessment Scheme (CHAS).
" Kingfisher completed a superb kitchen extension to our home. A pragmatic and logistical approach was required due to the fact that our home was occupied throughout. The works were intricate; involving structural modifications, removal of an existing chimney, in one of the wettest summers on record. Despite this, it is a complete testament to the construction team involved that the project was done to a very high standard and great effort was made to minimise disruption to us. The end result was amazing and transformed our home. 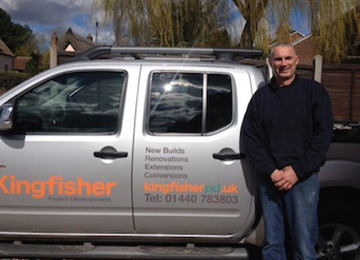 If you are looking for a high quality, considerate and financially competitive builder - then we strongly recommend Kingfisher. "